Let's Talk About Lazy Kates! 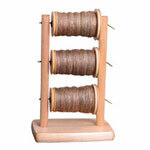 Every spinner needs a good lazy kate to make plying a breeze. You may be overwhelmed by the endless options available, so we'd like to make things easy for you by talking about the finer points of selecting and using a lazy kate! Tensioned vs. Non-Tensioned Have you ever tried to ply your singles, only to have them kink up, creating a tangled mess? A tensioned lazy kate can solve this problem, giving you more control as you ply via the brake band that loops over the bobbins to keep the bobbins from spinning freely. Even better, should you decide you'd like to ply un-tensioned singles, you can simply remove the bands. It's awfully nice to have the option! Plenty of lovely yarns can be spun with a non-tensioned lazy kate, but if you find you often have tangles while working, it might be time for an upgrade! Stability Matters No matter where you stand on the issue of tension, having a stable lazy kate is important. You'll spin through your singles much faster if they aren't constantly tipping over while you work! Many models are designed to be clamped to a work table; another option is to choose a model that has enough weight to keep it in place. Location, Location, Location! Where and how you place your lazy kate matters, too. 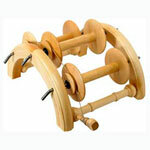 Many spinners prefer to tilt their lazy kate at an angle to provide a smoother flow of yarn while working; if this is the case for you, then you'll want to purchase a model that won't compromise stability while you work. Placing the lazy kate to one side slightly behind where you are sitting will make it easier for you to keep the yarn moving. The Anything-But-Lazy Kate We're quite excited about a new lazy kate that recently arrived at The Woolery: The “Anything but Lazy Kate™” by Nancy's Knit Knacks has an extensive list of features that spinners will not find anywhere else! 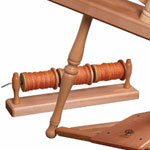 Employing a tilt-back design, this lazy kate uses gravity to provide a certain amount of tension on the bobbins. Better yet, the angle of tilt is infinitely adjustable to suit any spinner's needs; a custom-designed lid bracket is controlled by an adjustable knob. There are three forms of tensioning and yarn control, plus each bobbin has it own adjustable yarn guide with a 1" diameter wire-form - perfect for art yarns! When you're ready to spin on-the-go, simply lock the hardwood box lid containing all of the guides, rods, pegs, and knobs, pick it up by the handle, and you're on your way!